Cedar bedding can cause a wide assortment of health problems in hamsters due to chemical compounds called phenols that naturally occur in the wood. Because of these potential health problems, the American Society for the Prevention of Cruelty to Animals does not recommended using cedar shavings as bedding for hamsters or other small rodents. Fortunately, plenty of safe alternative bedding options exist. Cedar shavings were a fairly standard bedding for small animals before veterinarians and pet owners learned about the potentially dangerous side effects caused by prolonged exposure to phenols. Phenols are naturally contained in and released by cedar and pine shavings. The Environmental Protection Agency has complied a list of phenol side effects that have been documented in humans and animals by various studies. Side effects include eye and skin irritation, breathing difficulty, elevated liver enzymes, muscle weakness, tremors, loss of coordination and gastrointestinal irritation. With plenty of safe bedding options available, cedar shavings have no place in a hamster's cage. Aspen shavings are available as basic chip shavings as well as in thinner shredded form. Aspen is a safe type of wood to use for hamster bedding. It does not have the negative health side effects on hamsters that cedar and pine have been linked to as aspen does not contain phenols. Recycled paper bedding is another readily available option for hamster bedding. These grains or pellets, made of recycled paper and other material, can take the place of traditional wood bedding. Recycled paper bedding is highly absorbent, effective at containing odors and environmentally friendly. The downside of recycled paper bedding is that it tends to be more costly than wood bedding. Corn cob bedding, often marketed as being natural or biodegradable, tends to be very inexpensive. Unfortunately such bedding products tend to be quite dusty. 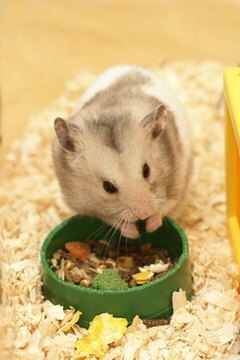 Fine dust particles cause respiratory problems in hamsters, and a high level of dust in your hamster's bedding will greatly increase the likelihood of your hamster developing breathing problems. In general it is best to avoid corn-cob-based litters as well as those that contain clay or are similar to cat litter. Similarly, clay litters have a high amount of dust. It's also dangerous; hamsters can't digest it if they scarf some down. Sometimes finding the right bedding for your hamster involves a little trial, a little error and a little more trial. If you are not happy with the bedding you are using or have discovered it may have undesirable health consequences, try alternative types of bedding until you find a product that works well for both you and your hamster. The ideal bedding will be absorbent enough to contain your hamster's urine and odors while still pleasant for your hamster to burrow in. Remember that you can mix different types of bedding together to create the perfect mixture.